Wynantskill - Elaine F. Adams Haskins, 87, of Dana Ave. St. Jude’s Apartments passed away Sunday, September 9, 2018, at Our Lady of Mercy Life Center after a brief illness, surrounded by her loving family. Born in Troy, she was daughter of the late Eugene Adams and Helen Berney Adams and wife of the late Emory C. Haskins Jr. She was raised in Wynantskill and from 1979-95 resided in Jacksonville and Daytona, Florida and was a graduate of Sacred Heart School in Troy. Elaine was employed as a cashier in the cafeteria at Hudson Valley Community College for 15 years and at Albany Medical Center Hospital for 6 years. 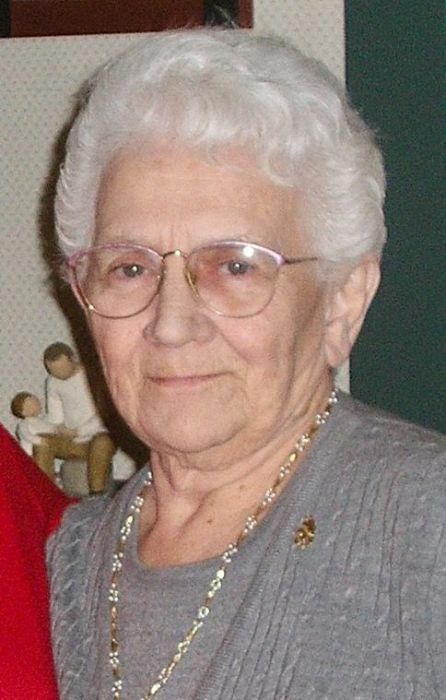 She was a Communicant of St. Jude the Apostle Church, a member of Wynantskill Seniors and enjoyed playing bingo. However, her most cherished times were spent with her loving family. Survivors include a daughter, Linda (Russell W.) King, West Sand Lake; two sons, Robert N. Haskins, Jacksonville, FL and Emory C. (Rose) Haskins III, Jacksonville, FL; 10 grandchildren; 17 great grandchildren; a great great grandson; special friends, Pat and Dave Toftegaard, West Sand Lake and several nieces and nephews. She was predeceased by a son, Douglas C. Haskins Sr. and five sisters, Dorothy Wolfe, Doris McKendry, Marguerite Adams, Evelyn Steen and Helen Cole. Relatives and friends may call at the St. Jude the Apostle Church 43 Brookside Avenue Wynantskill on Thursday September 13, 2018 from 10AM-12 Noon with a Mass of Christian Burial celebrated at 12 Noon with Rev. Anthony Ligato, Pastor. All are invited to meet for a graveside service at Warren Cemetery in Boyntonville Friday at 11AM. In lieu of flowers contributions may be made in memory of Elaine F. Haskins to St. Jude the Apostle Church 43 Brookside Avenue Wynantskill, NY 12198 or Our Lady of Mercy Life Center, Activities Dept. 2 Mercycare Lane Guilderland, NY 12084.